Start. : Punch Fear in the Face, Escape Average, and Do Work That Matters, by Jon Acuff – as it says on Amazon, “Wall Street Journal best-selling author Jon Acuff reveals the steps to getting unstuck and back onto the path of being awesome.” I love how Jon describes the difference between the average path and the awesome path (guess which on you should be on). An easy read via Audible. Predictive Analytics: The Power to Predict Who Will Click, Buy, Lie, or Die, by Eric Siegel. I’ll admit, I read this for a class on Data Analytics. However, it was interesting enough to finish on purpose. If you’ve ever wondered what “Big Data” is and how companies use it to predict your next purchase, this is one of the books you should read. 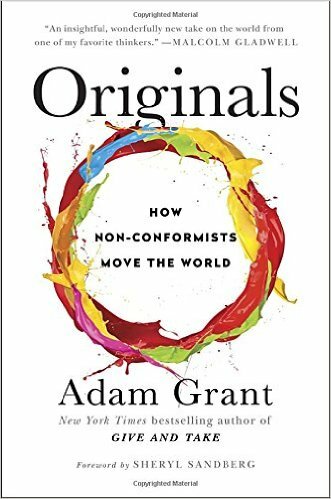 Originals: How Non-Conformists Move the World, by Adam Grant – This was another easy Audible listen. Interesting stories about challenging group-think and making innovation stick with examples from Challenging Steve Jobs, making change happen in the CIA and even how Seinfeld happened because of an executive who knew nothing about comedy. Finding your Sweet Spot, by Kene Iloenyosi – This was written by a friend of mine, and I really like his process of working through your interests and discovering your passion. The Phoenix Project: A Novel About IT, DevOps, and Helping Your Business Win, by Gene Kim, Kevin Behr and George Spafford – This is a work of fiction about an IT (Information Technology) department and how they became more effective at delivering to their business. No, seriously. But it’s a must read for any IT professional. What I tell everyone is this: If you want to understand what your boss is thinking, read this book. This was another easy Audible listen. Sprint: How to Solve Big Problems and Test New Ideas in Just Five Days, By Braden Kowitz, Jake Knapp and John Zeratsky – I started this one in December, but I need to finish it soon. This method is what Google used to create Google Hangouts, among other successes. Million Dollar Maverick: Forge Your Own Path to Think Differently, Act Decisively, and Succeed Quickly, by Alan Weiss – I’ve always been a fan of Alan’s work. I’m looking forward to this one. Web Analytics 2.0: The Art of Online Accountability and Science of Customer Centricity, by Avinash Kaushik – Again, this is one for a Data Analytics class coming up this month. i’m interested to learn more about analyzing web traffic and using that data to improve my site. The Undoing Project: A Friendship That Changed Our Minds, by Michael Lewis – the same guy that wrote Moneyball and The Big Short. This one is about Daniel Kahneman (who wrote Thinking Fast and Slow) and Amos Tversky. I really liked that book and it seems that the background from Lewis will make an outstanding read. That’s my start for 2017. What will you read?